What do fit, strong people do as part of their lifestyle habits? 1. They don’t “diet!” They make their eating style their lifestyle. I eat the same way daily and I mix up what I do eat. I eat every 3-4 hours. I have some form of eggs for breakfast (scrambled, hard-boiled, omelette) and sometimes ham or bacon with it. I have a healthy snack. Then, lunch is some form of a healthy salad with a delish protein either in it or on the side. I have fruit twice a day, veggies twice a day (sometimes with my lunch and dinner or I vary it). I have another snack before dinner (can even be a low carb chocolate snake or protein bar), and dinner is similar to lunch, but I make it slightly different and tasty. And my last snack could be anything, including low-carb ice cream or frozen yogurt. I enjoy my food. I pick tasty things, but I steer away from heavy carbs. This is my life and I am skinny for two years now. 2. Eat Breakfast. See number one. You set off your metabolism and your mood for the whole day with breakfast. Start the day right. 3. Enjoy your exercise. I love going to my Pilates and yoga classes. I enjoy the elliptical time I do because I use my IPAD and catch up on things. Some people love meeting a friend and going for a hike or a bike ride. Some people swim, play racquetball, Zumba, Salsa, belly dance, etc.. Find something you like to do and do it. 4. Make Fitness a Priority. I make my plans every week in my planner on what times my classes are and what times I will go on the elliptical. If you have a hectic schedule, you must find places in it for exercise. If you don’t come first and you break down, then all of the things that you do won’t be done anymore because you are too sick to do it. Trust me, I know what that is like and you don’t want it to happen to you. Don’t take your health for granted. You can break it down by NOT maintaining your machine (body). 5. Don’t compare yourself or your body to others. Everyone is different. Look at the Williams’ sisters in tennis. Their bodies are different from many other tennis players. They are very strong and they are winners, but they are considered larger–but they are fit. Everyone is different. 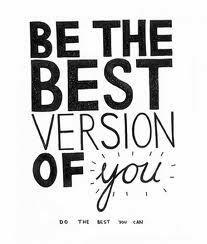 Just be the best YOU that you can be. 6. Find Support. If your friends, peers, workmates or family try to sabotage your efforts, then find SOMEONE who can support your healthy eating habits and exercise. Find a running buddy, a healthy lunch buddy, go to Overeaters Anonymous meetings, go to counseling–just don’t stick around people who are jealous of your efforts or just don’t get it! 7. Learn to say NO! It is ok to say no. Someone knows you are on a diet or not, and offers you cookies that they made SPECIAL FOR YOU! You say, “Thank you, so kind of you, but I am not eating cookies right now. Please let me give them to someone.” Your accepting cookies, which will call your name and make you want to eat them is not a good thing and you can’t be afraid to upset someone if it means you going off of your planned meal changes. You should tell people up front that you can’t have sugar. Sometimes it is easier to just blame your doctor. You don’t have to tell people you are changing your diet. You can just say, “Oh thank you. My doctor told me that I can’t have sugar right now and it is doctor’s orders.” It is hard to argue with your doctor. If you say YOU want to diet, you have to be strong enough for people to argue and say, “One cookie won’t kill you,” “It is ok, you look fine, you can eat a cookie.” ETC! SO, sometimes it is easier to say your doctor said so and that is that. Whatever you have to do, but do it. Even my own mother used to try to shame me into splitting a desert with her and I would say, “NO!” And she sulked, but who is being the child? And interesting enough, she is the one who is pre-diabetic. So, I have to be in control of my own destiny. When I go out to restaurants and they want to bring bread to the table, I tell them up front NOT to bring the bread. I have learned that it is no one’s business what I eat or why. If someone wants to challenge me, I say, “This is my diet and that is the way it is and I don’t want to talk about it anymore.” Seriously, it is NO one’s business!